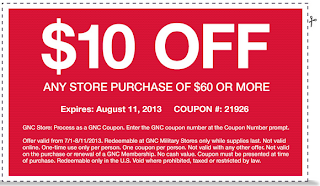 If you every shop at Military GNC locations, take advantage of this $10 off coupon. Purchase must be over 60 dollars. The coupon does not have a bar code but rather just a coupon code (21926) so you should be able to just show it on any mobile device without printing it.